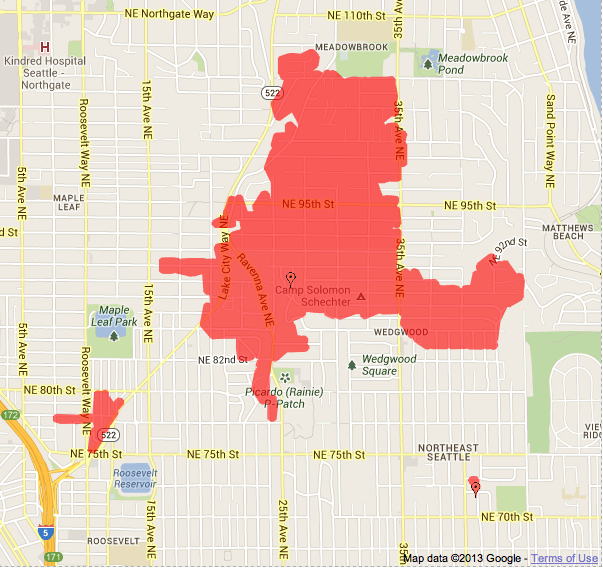 Around 3:30 this afternoon, Seattle City Light customers along NE 75th Street from Roosevelt to View Ridge lost power. About 3700 customers were affected, with the cause listed as “Tree” on the city’s power outage page. 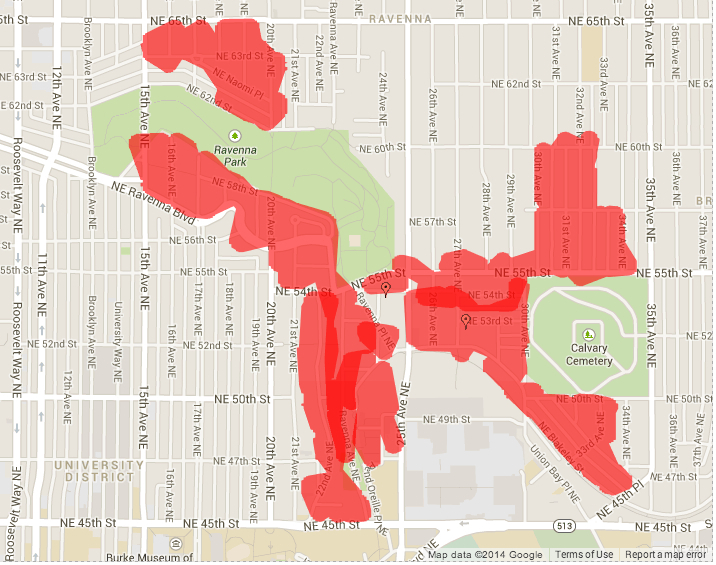 Then, about an hour later (after partial restoration to the earlier affected area), a large wedge-shaped swath north of about NE 80th Street between Lake City Way NE and Lake Washington also lost power. 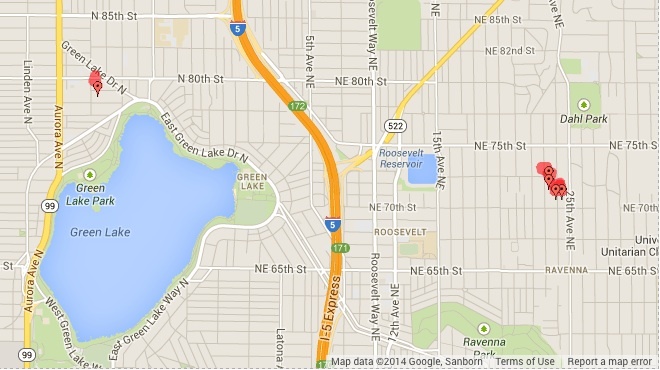 About 8,600 customers are affected in this area, with many traffic signals on Lake City Way and other arterials out. An online weather station in the Bryant neighborhood registered four gusts of wind above 20 mph after 2 PM. The barometer continues to fall as well, so we may be in for more blustery weather. UPDATE (5:43 PM): Seattle City Light saying on twitter that many customers should start seeing power back in the next 45 minutes. UPDATE (10:08 PM): A brief yet heavy rain around 6: 20 PM knocked out power to another small group of homes. SCL saying at this time that approximately 482 customers are still without power. Estimated restoration time for this group — 34th to 46th Avenues NE on the west and east, and NE 110th to 97th Streets north and south — is after midnight, possibly 2 AM. At about 4:26 PM on Saturday afternoon, the weather turned TOO EXCITING near Ravenna Blog HQ. 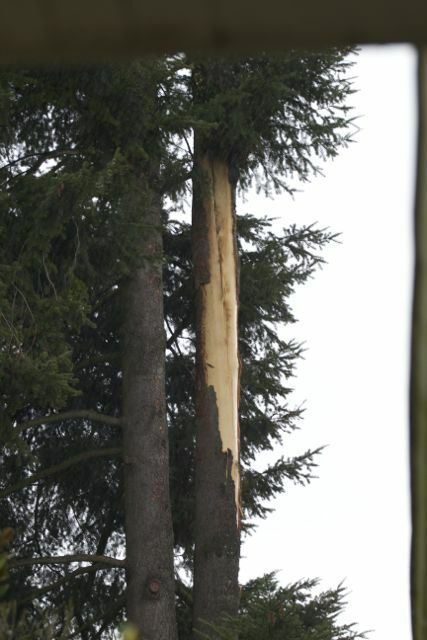 Lightning struck a tree just a couple hundred feet away, sending bark flying, hearts pounding, and causing a small power outage. Engine 16 stopped by to check things out briefly. 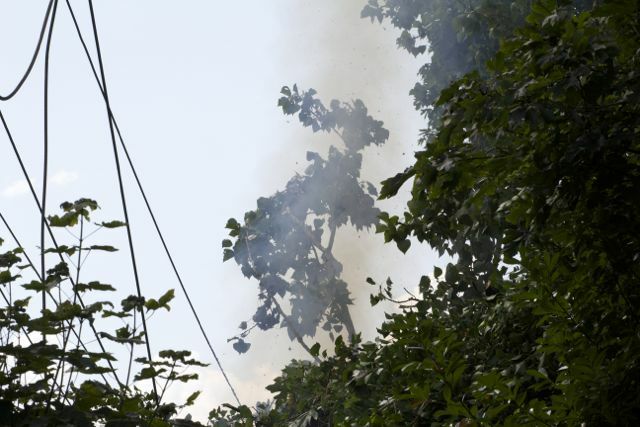 A light smell of wood smoke hung in the air, and a homeowner nearby mentioned a cracked window. Power was lost the instant the lightning struck, but the outage looks to be a small one, affecting around 60 households. Good to see you, too, Seattle City Light! UPDATE (6:15 PM): Estimated time of restoration for the Ravenna outage is around 1:30 AM, but you should check back here later for updated information. It was around 5:49 PM that the tweets started coming in. @RavennaBlog @SEACityLight Power outage near Latona Pub. I am abt 2 blocks away from there. And power just went out here in the middle of me writing a tweet about power being out. 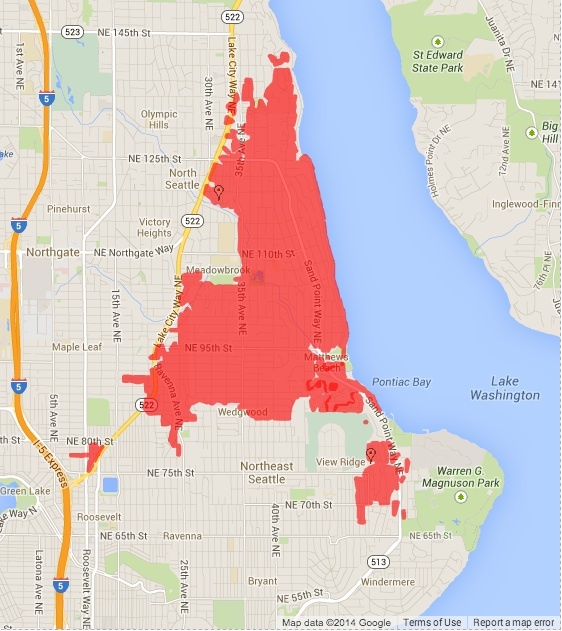 By the peak of the power outage, practically ALL of Northeast Seattle was in the dark. 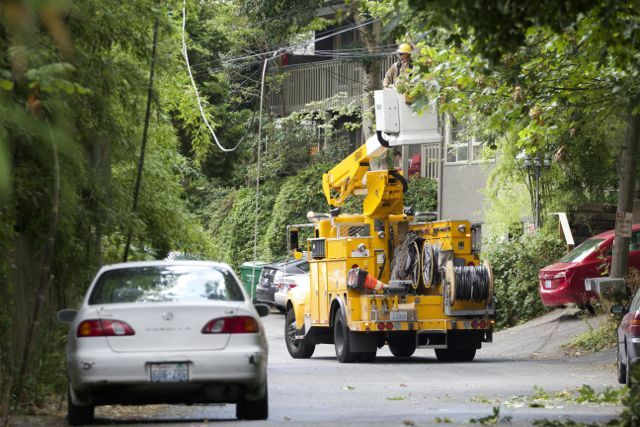 More than 43,000 Seattle City Light customers affected. After 5:30 p.m. this evening, a breaker failure in the North Substation caused a power outage to more than 43,000 customers. The cause of the breaker failure is still being investigated. As of 8:30 p.m., customers in the area have been fully restored by crews. 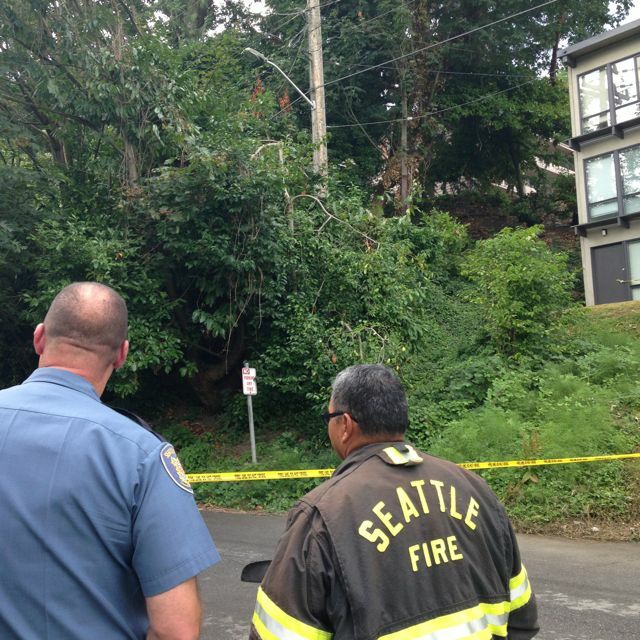 To the North – NE 123rd St.
To the South – NE 35th St.
We’ll update this post with more information should Seattle City Light further determine the cause. As the lights in Ravenna Blog HQ gave a few flickers just before 5 PM, and we started hearing reports of power out in Wedgwood, we decided it was a good time to start a running weather post for the rest of the evening. @RavennaBlog we just lost power in Wedgwood! Arooo…no Husky game! 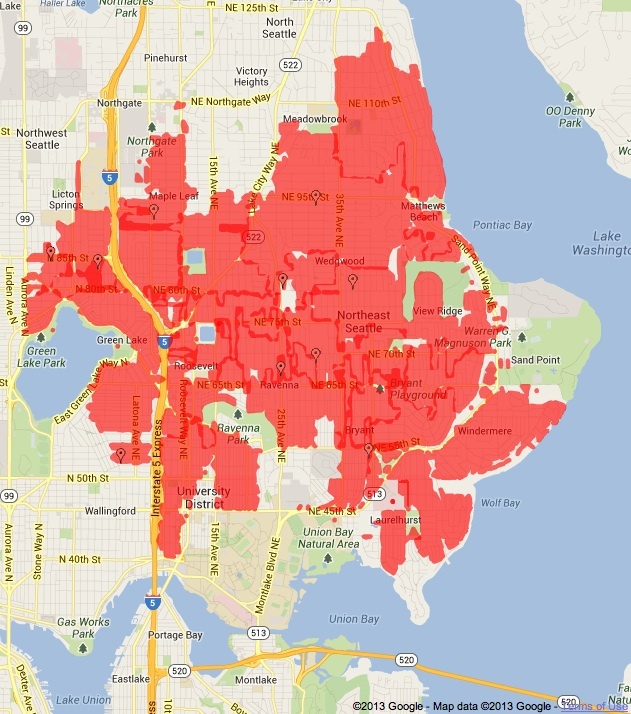 In Northeast Seattle so far, there is an outage in Wedgwood affecting ~3,000 customers, according to the Seattle City Light hotline (206-684-7400 should you need to report your own outage). If you’re curious about outages in the city, you can visit the Seattle City Light System Status page for more information (mobile link here). 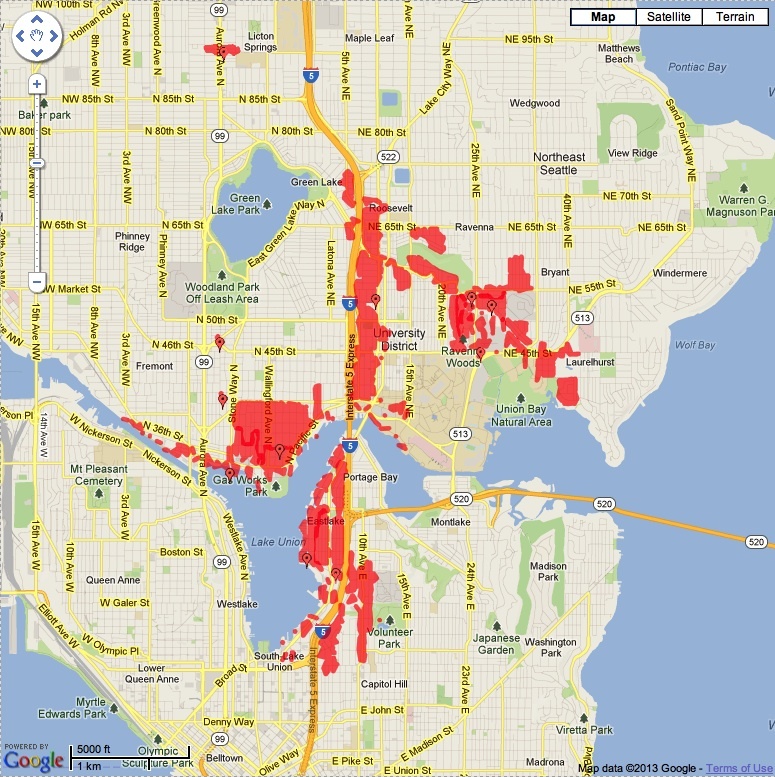 UPDATE 5:30 PM: Latest Seattle City Light outage map update showing 10 outages city-wide, with 1107 customers affected. No Wedgwood on the map yet. 5:44 PM: Latest outage map tally is “Number of Outages: 14, Estimated Customers Affected: 7870,” which does not include the Wedgwood outage. We’re hearing now of an outage on 100th in Meadowbrook. Might be part of the Wedgwood outage, but we don’t know until the map is updated with that information. 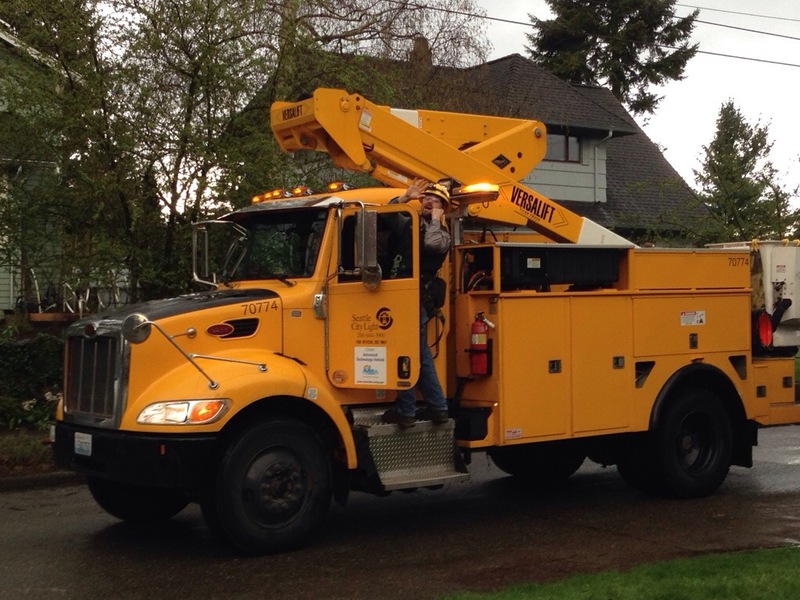 North -Serving Ravenna, Bryant, View Ridge, Matthews Beach, Wedgwood -2,858 customers without power -Estimated time of restoration is 11 p.m. -Cause weather related (wind, rain, tree branches) -Boundaries: N – NE 106th St; E – Lake Washington; W – 8th Ave NE; S – NE 75th St. The post also says that 20,000 customers are currently without power in Seattle. 8:45 PM: We’ve heard from a few people in the Wedgwood area of the outage say that power has been restored. WE HAVE POWER, AN HOUR EARLIER THAN @SEACityLight ESTIMATED. But before that, around 8 PM, about 46 customers between Matthews Beach and View Ridge lost power. Cause now given as equipment failure, with a restoration estimate time of 4 AM. 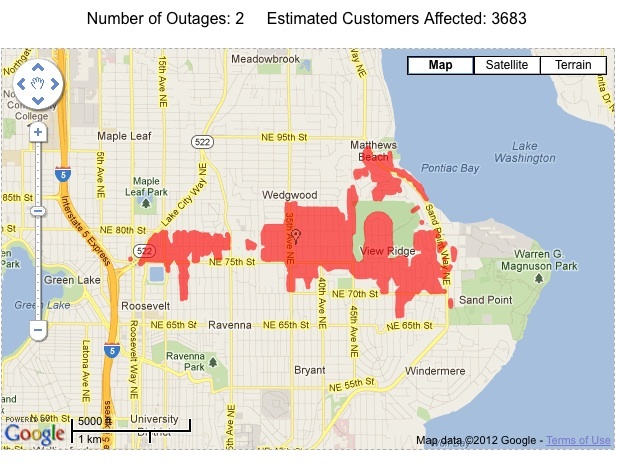 Sunday, 7:34 AM: Outage map showing only four outages left in Seattle, three of which are in Northeast Seattle. Only 10 customers total affected, 9 of which are directly north of the Sand Point Country Club area. 7:55 AM: Some weather stats from yesterday, courtesy a weather station in Bryant that we use for such information: 1.45 inches of rain fell yesterday, and the average wind speed was between 9 and 13 mph (with gusts up to 28 mph). As the large cold front approaches and comes inland this evening, wind speeds are expected to climb — the data in our area suggests we’ll be seeing sustained wind speeds in the low- to mid-20 mph range from noon on (High Wind Watch). Gusts to 60 mph are also possible, especially between 7 PM and midnight. So, get your laundry and dinner done early. And don’t forget to charge your wireless devices so you can revisit this post for more information. 8:03 PM: Rain coming down steadily now, and the wind has picked up. Seeing gusts now in the mid-20 mph range. Rain total for the day (at the Bryant weather station) at 0.33 inches, with most of it falling in the last hour. So far, only one outage in Northeast Seattle to report, and even it’s one that’s been going since 2:51 PM: Ten customers just south of Penguin Park (NE 93rd Street and 38th Avenue NE). Estimated time of restoration is about 10 PM. 8:12 PM: And as soon as I added the above outage to the post, it disappeared off the outage map! The power of neighborhood news, everyone. 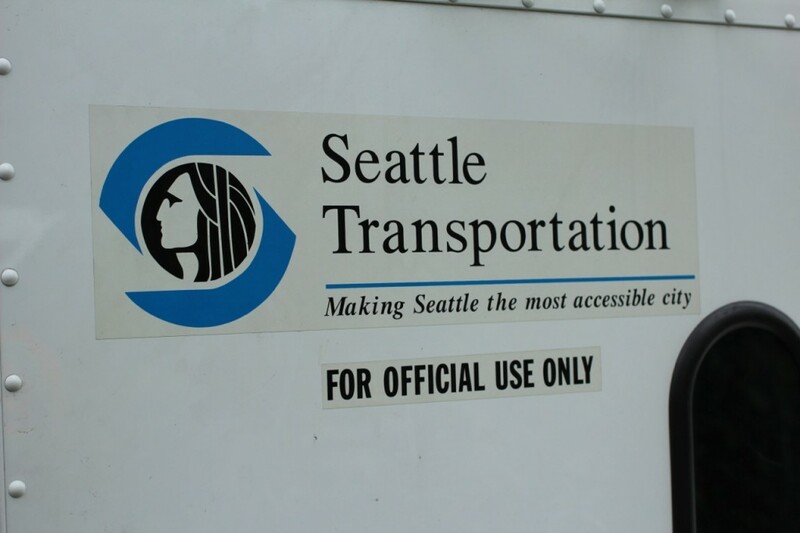 This morning, a crew of three Seattle Department of Transportation (SDOT) workers started installing the first of two flashing school zone beacons on NE 75th Street. We were told by a crew member that both beacons, one on either side of Eckstein Middle School, would be installed by tomorrow, Friday, April 5. Once the beacons are in, the next step is for Seattle City Light to hook them up to power. 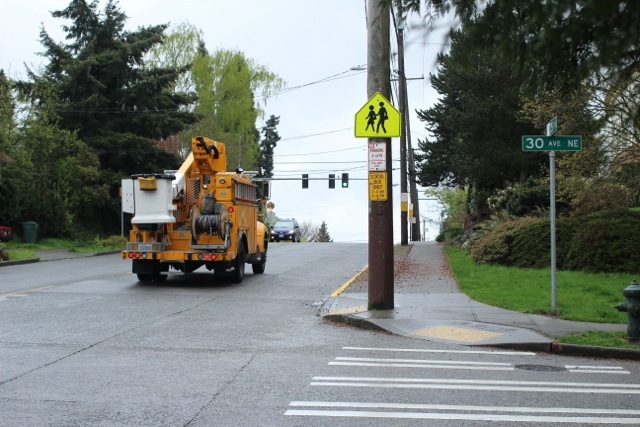 These flashing school zone beacons are one of the first projects listed by SDOT as planned improvements to NE 75th Street. Thank you to the Wedgwood Community Council, who spotted the work happening this morning and spread the word on twitter. 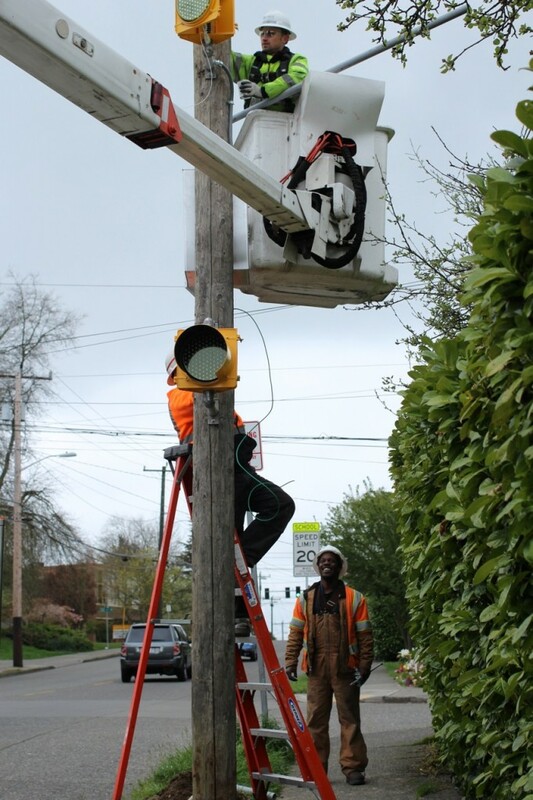 UPDATE (Monday, April 22): On Friday, April 19, we got word from Seattle City Light’s Scott Thomsen that a crew had connected the east beacon that morning already, but would be back around 1 PM to connect the other. With that notice, the entire Ravenna Blog newsroom sped up the hill, in the rain, to catch the crew at their work…only to reach them just as they were pulling away! Now that spring break is over for Seattle students, we’re looking into whether the beacons have been in use yet or not. We’ll update this post again when we know for sure. Lightning, thunder, hail, and power outages: Happy Saturday! Saturday afternoon started off exciting enough: Lots of rain. Lightning and thunder starting around 4:40 PM. Then some hail. LOTS of hail in some places. Power outage along 45th. Traffic signals are dark. Lower Wallingford. Then SE Green Lake. Eastlake. Montlake. Ravenna and NE 65th Street. South University District. Screen grab of the Seattle City Lights outage page, taken around 7 PM. Service to Green Lake and Montlake had already been restored, but nearly 15,000 other customers were still affected. Power outage in the UDist affecting about 10,000 customers caused by an equipment failure at Univ. Substation. Crews are working to restore power in the University District. Initial estimate for full restoration set for 1 a.m. Cause of equipment failure at University Substation was a lighting strike. Damage took down the entire substation. Repair crews are bringing large “feeder” power lines back to service. As neighborhoods are energized, some localized problems could occur. And as now (7:30 PM), power is coming back in some of the affected areas. @lauralambeth @mcmahonuw @seacitylight Ha ha! Right on. It’s all cats and pictures of food, until the power goes out. Shortly before 1:00 PM this afternoon, sections of seven Northeast Seattle neighborhoods lost power. At peak, approximately 3,800 customers were affected. Screen capture of the outage at its peak taken from Seattle City Light’s System Status webpage. Parts of Roosevelt, Ravenna, Bryant, Wedgwood, View Ridge, and Sand Point all took a hit along NE 65th St, while nearly all of Windermere went down. The estimated time of restoration was listed at 3 PM, but many customers are seeing their lights coming back on ahead of that time. Last week’s outage was blamed on a tree (and the high winds helped, we imagine). But what’s to blame this time? 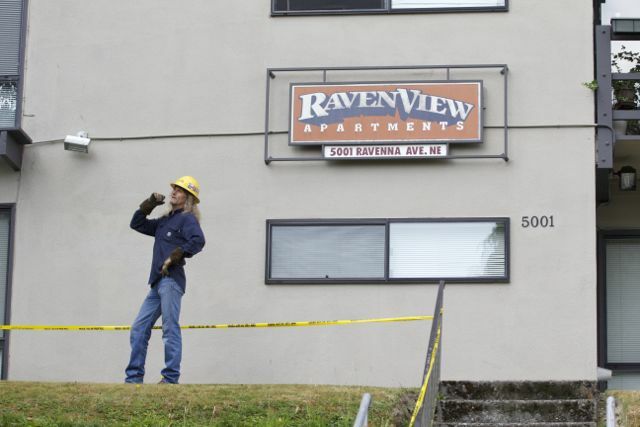 NE Seattle outage down to 1600 homes, businesses. Crow on a switch believed to be the cause. Crews checking equipment. A crow. Nature is out to get us, apparently. UPDATE (2:58 PM): A quick check of the outage map reveals everything back to normal. UPDATE (2:08 PM): Outage down to approximately 1,200 customers now. UPDATE (1:03 PM): outage is down to approximately 1,800 customers Mostly in the Matthews Beach/View Ridge area of the map below affected. No, it’s not a comment on any Michael Bay movies — it’s a power outage. 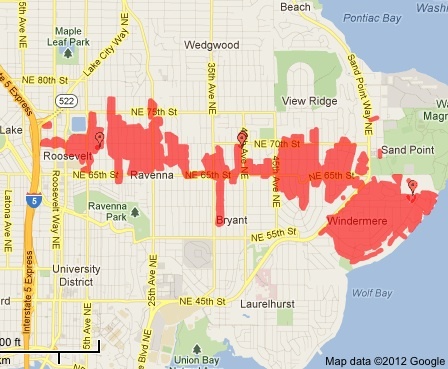 Seattle City Light outage map screen grab from 12:45 PM. 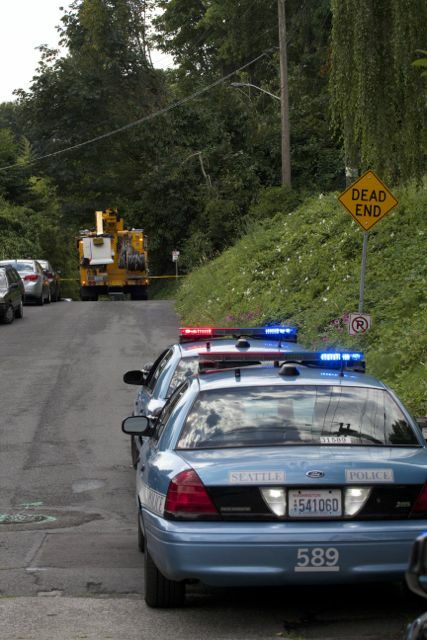 Seattle City Light crews were responding to a power outage Tuesday that affected about 3,600 homes and businesses in the Ravenna, Roosevelt, View Ridge and Wedgwood neighborhoods of northeast Seattle. The outage started about 11:20 a.m. A cause was not immediately known. An initial estimate for restoration of service was set for 3 p.m. 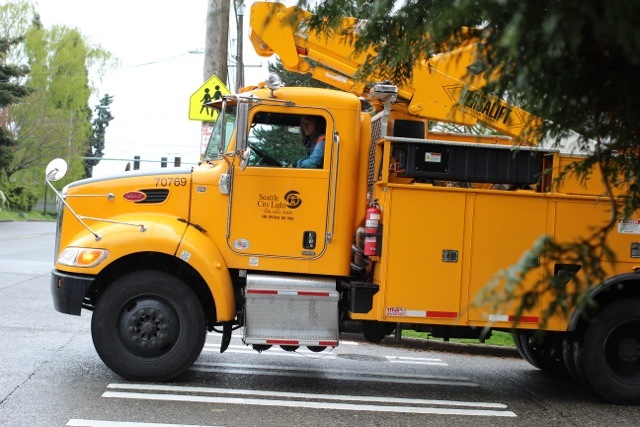 The general boundaries of the outage were NE 94th Street on the north, NE 65th Street on the south, Roosevelt Way NE on the west and Lake Washington on the east. As of this posting, the cause is listed as “tree,” and the restoration time is estimated at 3:00 PM. As we were calling the North Precinct about the dangerous traffic conditions at 15th Ave NE and NE 75th St — signals are out and many drivers on NE 75th St are not noticing and treating as a four-way stop — the officer on the other end of the phone blamed the outage on two transformers lost from the tops of poles, but we haven’t had confirmation of the exact cause from Seattle City Light.